Why are biscuits called shortcakes ? Britishfoodhistory.wordpress.com explains “the large amount of butter is what makes shortbread (or shortcake) short: the term short, when applied to biscuits and pastry, means crumbly, like shortcrust pastry should be.” Homemade shortcakes or biscuits provide the dessert base for strawberry rhubarb compote and your choice of creamy topping, like whipped cream or yogurt. Why not add some tart cooked rhubarb to your shortcakes? Rhubarb season runs April to September and makes a great pie or fruit compote. Although technically a vegetable, bright red and green rhubarb stalks give strawberry shortcake a fresh, unique twist. 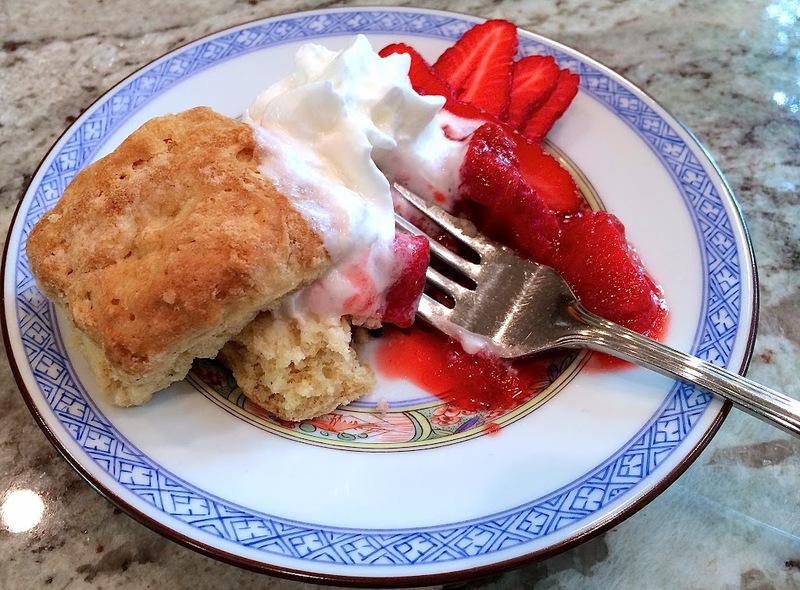 With just 7 ingredients (no eggs), this “shortcake” can be made in thirty minutes. 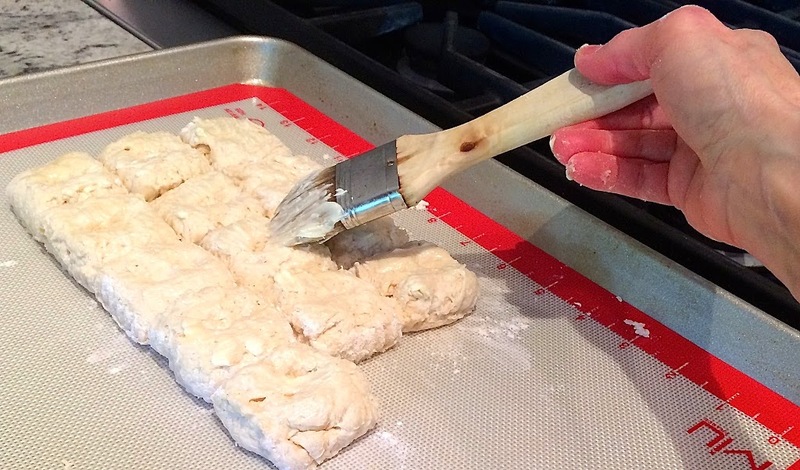 No rolling pin or mixer necessary! As an option, make these biscuits vegan with vegan “butter”. While the shortcakes bake in the oven, the rhubarb simmers on the stove. Leftover shortcakes offer breakfast or lunch options tomorrow. Let these photos guide you through this easy dessert preparation and dig into this season’s rhubarb while it lasts! Make the shortcakes: Preheat oven to 450 F or 425 F convection. 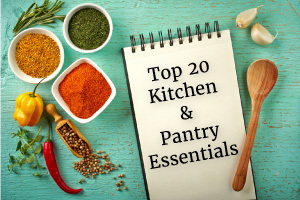 Line a baking sheet with parchment or silpat and set aside. 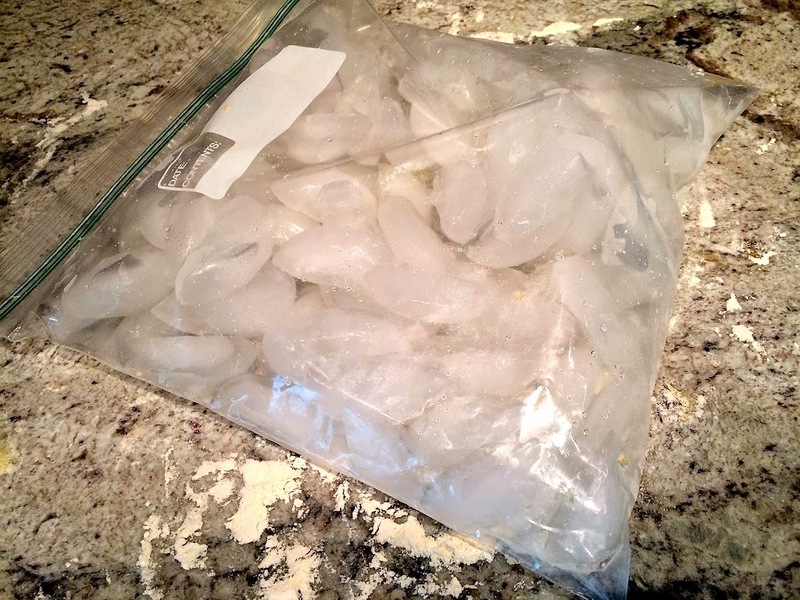 (Optional: Place plastic ziptop bag filled with ice on countertop while prepping biscuit dough to get surface very cold.) 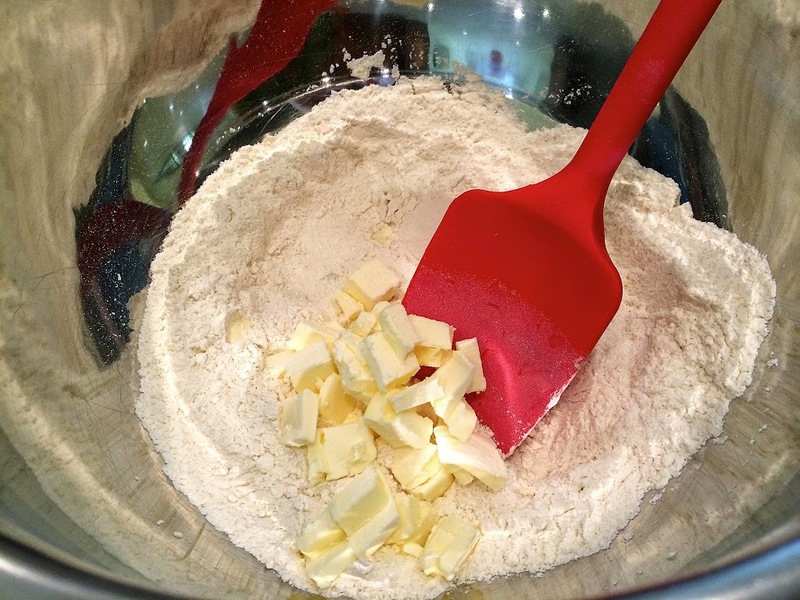 Mix flour, baking powder, baking soda and salt together in a large bowl. Using fingers or a pastry cutter, work quickly to rub in cold butter until it is the size of small peas. Slowly stir in milk and lemon juice mixture, a fourth a cup at a time, until just combined. Dough will be sticky. Form the shortcakes (biscuits): Use light hands. No rolling pin required. 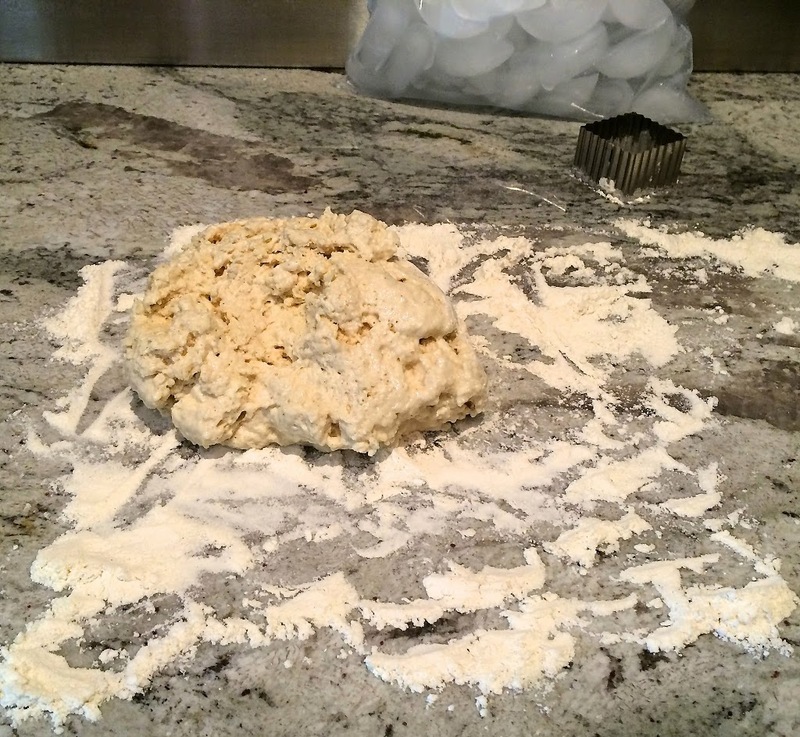 Place dough on a clean (cold) countertop dusted with flour. 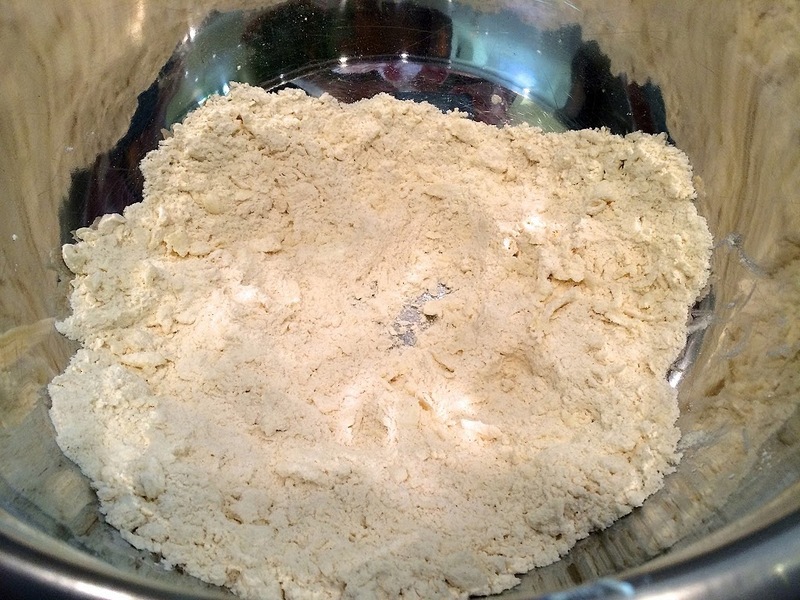 Add a little more flour on top of dough and gently turn dough over six times. Lightly pat the dough into a one-inch thick rectangle or disc. 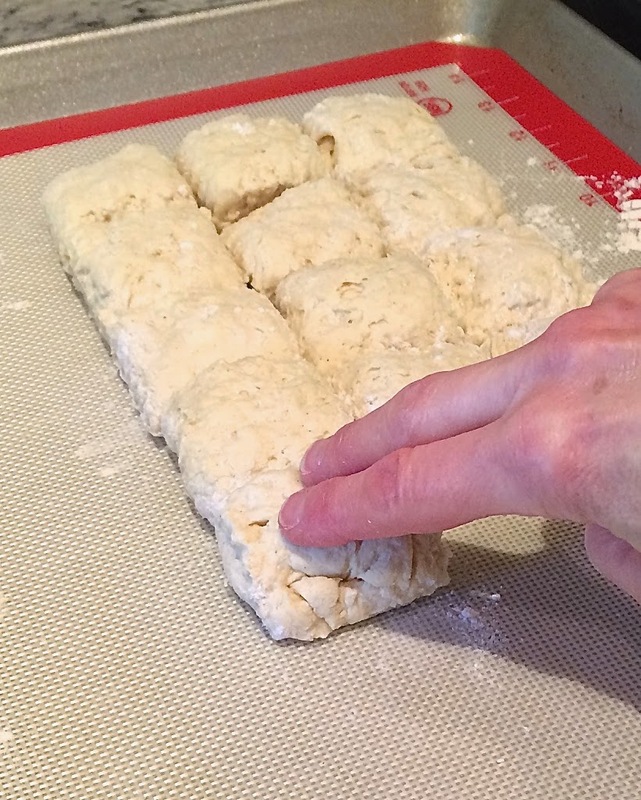 Using a 1-2 inch biscuit cutter or similar sharp object (like a cocktail shaker), dip cutter in flour and then push straight down through the dough. 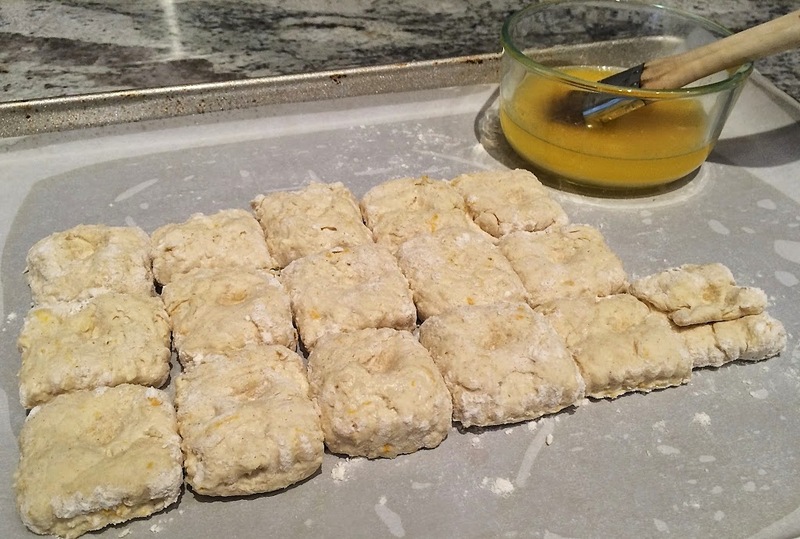 Repeat and gently reform scraps until you have about 7-8 large biscuits or 15-16 small ones. 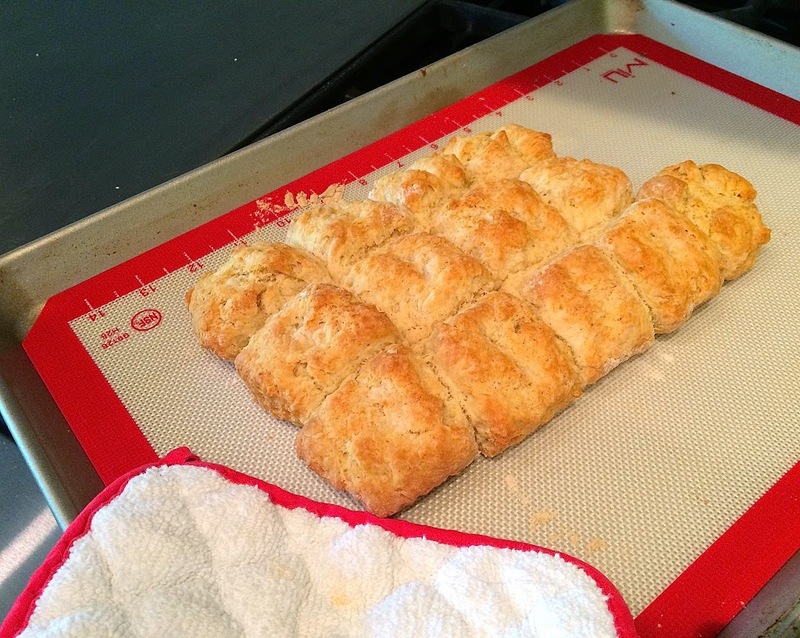 Place cut biscuits in rows of two or three on sheet pan. For proper rising make sure biscuits just touch each other and gently press down in the middle of each cut biscuit with two fingers. Brush tops with melted butter of choice. Bake 10-15 minutes or until lightly browned. Make the compote: In a large saucepan, bring rhubarb and honey (or sweetener of choice) to a boil. 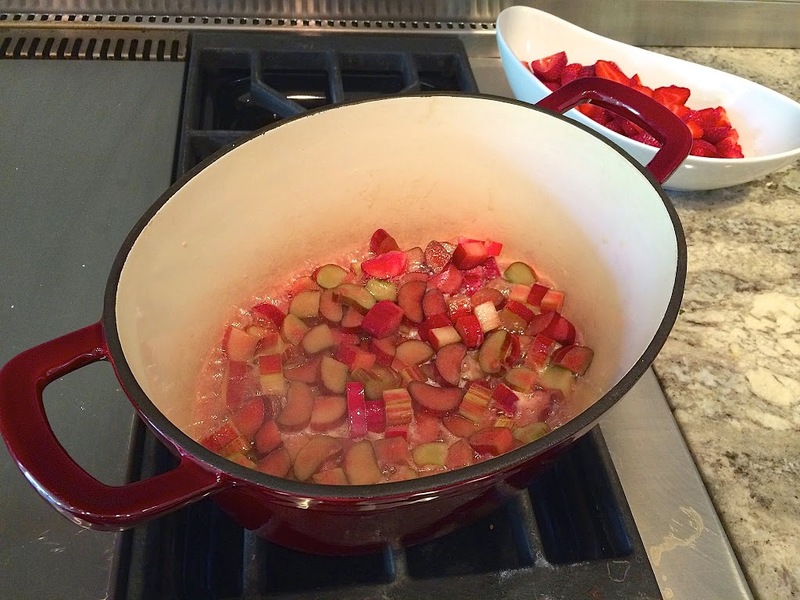 Reduce heat and simmer gently about 10 minutes until rhubarb begins to soften and fall apart. Remove from heat and let cool completely, then add in sliced strawberries. Adjust for sweetness and refrigerate until ready to use. Reserve some whole strawberries as a garnish to slice just before serving shortcakes. Assemble: Slice biscuits and place a heaping spoonful of compote on bottom biscuit. Top with whipped cream (or yogurt) of choice and top with other biscuit half. Garnish with more compote, whipped cream and fresh sliced strawberries. Biscuits: Serve for breakfast or anytime with butter, jam or honey. Compote: Serve over ice-cream or atop toast, waffles or cake.